Now let me start out by saying I am NOT a regular Trekkie. 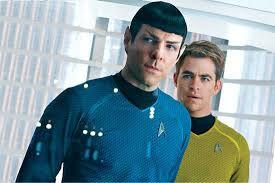 But I did see 2009’s Star Trek and I gotta say, I was very impressed by it. But I will say that I was familiar with the infamous ‘odd number curse” that seemed to apply to the first nine movies. However, Star Trek: Nemesis and 2009’s Star Trek proved to apparently switch around the curse. So, as you might imagine, this puts a lot of pressure on Star Trek Into Darkness to finally break the curse once and for all. And while it’s not an exceptional movie, I’d say it succeeded. Captain James T. Kirk (Chris Pine) is traveling to Kronos with his crew, which includes Spock (Zachary Quinto), Uhura (Zoe Saldana), and Scotty (Simon Pegg). But a new villain (Benedict Cumberbatch) has a dastardly plan. And the crew will have to battle on more than one level in order to defeat him. I see now why so many people are attracted to Star Trek: the characters. You can have a conversation with any one of these people, and they all have their own little ark that’s continued from the first film. Plus little things like production design and sound design. Oddly enough, the best thing in the movie is the amazing soundtrack by Michael Giacchino. Plus the clever humor. I’m not going to say that this movie is a masterpiece. The friendship between Kirk and Spock is not as interesting as it was in the film’s predecessor, and I think that the same can be said about the film in general. The original set up the characters and the world in a whole new light. This one just seems like it’s not as clever as the first film, and a few of the surprises are a little obvious. But on the whole, it’s an enjoyable film. P.S. I’m aware that I haven’t been seeing a lot of current movies lately. I will be trying to see more films in the future. P.P.S. I have a feeling my next review is going to be epic. I’m not a trekkie either, and wasn’t familiar with the odd number curse. Interesting! I’ve gotta agree with you – I think this movie broke it! I liked this movie just as much as 2009’s Star Trek. But you’re right about the relationship between Spock and Kirk in this movie – definitely not as interesting and complex. Overall a good film though! I enjoyed the movie a lot, despite some flaws. I’m a Trekkie but I’ve been fine with these remakes so far (it’s a great move that they decided to go with the alternate universe in rebooting it. That way if they need to change certain things from the original story, you have the “alternate universe” angle as a reason. I don’t think it would have worked if they tried to retell the story completely.). One thing I liked is that, after going off, really out of a need for revenge, after the terrorists, he stops and thinks before reacting when presented with the terrorists story, which is a plausible one. I wasn’t sure if the ending was necessary since it’s a retelling of a really iconic moment in ST history, but I didn’t mind it that much either. (I’m sure there were some Trekkies who were fuming).